Temple University School of Medicine researchers have developed a new biosensor that sniffs out explosives and could one day be used to detect landmines and deadly agents, such as sarin gas, according to a paper in the June issue of Nature Chemical Biology. 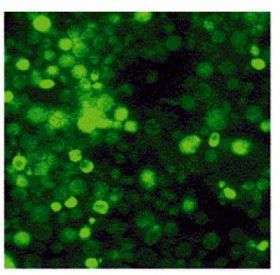 To create the biosensor, Danny Dhanasekaran and colleagues genetically engineered a yeast strain with mammalian (rat) olfactory signaling machinery and genetically linked it to the expression of green fluorescent protein. Into these yeast cells, they cloned individual rat olfactory receptors. When the olfactory receptor "smells" the odor of DNT, an ingredient in the explosive TNT, the biosensor turns fluorescent green. The research team is the first to identify, clone and sequence this novel olfactory receptor. "We suspected that harnessing the potential of the olfactory system, which can detect innumerable chemical agents with unparalleled sensitivity and selectivity, would be of immense value in the detection of environmental toxins and chemical warfare agents even at sublethal levels," said Dhanasekaran, Associate Professor of Biochemistry at Temple’s Fels Institute for Cancer Research and Molecular Biology. The research team is now perfecting the utility of the biosensor, for example, its response time, and believes that the potential therapeutic applications extend beyond the detection of chemical agents. "With further genetic fine-tuning of the olfactory receptor pathway, this system could also be used to screen experimental medications, a crucial step in the development of new drugs," said Dhanasekaran. Biosensors, which are made from natural ingredients, are preferable to man-made sensors, which can be expensive, cumbersome and inflexible. Dhanasekaran envisions that the biosensor will soon be incorporated into a handheld device or a remote device that can be left at a location and monitored from afar.